Samsung unveiled its long-awaited foldable flagship phone during its Galaxy Unpacked event last month. Imaginatively called Galaxy Fold, the all-new device has an expansive 7.3-inch Infinity Flex Display that opens and closes like the pages of a paperback novel, as well as a 4.6-inch Cover Display that lets users make calls, open apps and reply to texts without unfurling the main tablet-sized screen each time. However, neither of these have resolved all of our unanswered questions about the Galaxy Fold: namely, does the foldable screen have a massive crease down the middle? In fact, Samsung deliberately kept the Fold locked away in a case on its stand at the Mobile World Congress tradeshow to keep these details under wraps. The reflective glass case has a fixed light source which both, purposefully or not, made it very, very tough to discern whether there even is a furrow down the folding screen. Thankfully, an unofficial new video has revealed exactly how much of an impact the folding mechanism has on the AMOLED display on the Galaxy Fold. The clip, which seemingly originates from Vietnam – where a lot of Samsung R&D work takes place, was spotted by Samsung-centric blog SamMobile. It seems likely this could be a genuine Galaxy Fold unit in the video, especially this close to the release date, which is scheduled for April 26, 2019 in the US and Canada, and May 3, 2019 in the UK. Foldable displays are always going to have a crease – the clue is in the name. However, this is the first time that we've had an unfettered look at the fold that runs down the centre of the 7.3-inch Infinity Flex Display. It's unclear whether this will be noticeable when you're using the device or watching a movie on the pliable screen. It's worth noting that the Huawei Mate X avoids this issue by keeping the foldable screen on the outside of the handset. 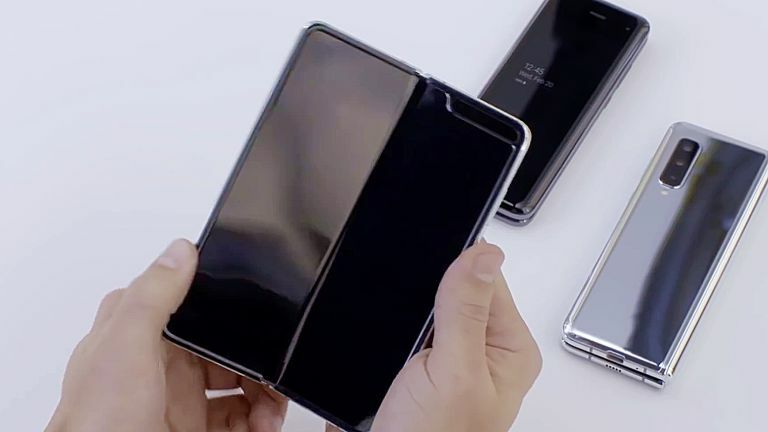 By wrapping the flexible OLED around the outside of the hinge, the fold does not need to be anywhere near as severe as the Galaxy Fold, which has a design that requires the screen to fold almost in half. Elsewhere, the video shows the Galaxy Fold closes with a healthy snap – something Samsung has talked about during its presentation. It also shows how the keyboard works on the 7.3-inch display, which takes up a sizeable chunk of the screen real estate, similar to Samsung tablets. Like the official video launched last month, the new video provides a really clear sense of just how expansive that internal display will feel when you're using it. That's something that those itching to get their hands on the €2,000 (£1,700) Galaxy Fold when it launches in the coming weeks.